I had a slightly difficult time getting into this novel, to be honest. Not that I didn't enjoy the characters, the narration, or the set-up. But compared to the middle through to the end, it was a slightly slow start. Perhaps it's because the flow of information evened out – at the start, there were many mentioned of bands, composers, artists, television shows, and movies. While setting the tone, it bogged the flow down slightly. Kiki made mistakes like any girl does – young and young at heart. She is passionate about many things, which I find to be a good thing. It took me too long to think as Kiki does near the end of the book. I had the 'feels' while reading, I won't lie. I look for books that make my belly twist up for the character, as if they are a real person, and The Sound of Us accomplished that feat. Music. Teenagers. Problems that face teenagers as well as adults. Romance, unrequited and not. Finding courage to fight for what you want/believe in, without losing your integrity. I believe young adults will go crazy for this title, as will their parents. I'm a serious person of the advanced age of 37, who isn't a fan of light and fluffy, and I enjoyed every page of The Sound of Us. One moral that hit me hard was how Kiki was willing to make room in her life for her friends, but she wasn't going to wait around for them, nor was she going to beg them to be in her life. Most girls never learn this lesson – some women never do. It took me until I was in my early thirties to realize you can open the door, but they have to be willing to come in on their own. If you spend all of your time pursuing, instead of enjoying each other, it's not worth it. **Is this a standalone? I'm sure it is, or could be... but there was a very wide door left open should Ms. Hammerle decide to cross the threshold and continue on with Kiki's adventures. *cough. cough* Pretty Please – I'll beg. Julie Hammerle is the author of A Place for Us, which will be published by Entangled Teen in the fall of 2016. Before settling down to write “for real,” she studied opera, taught Latin, and held her real estate license for one hot minute. Currently, she writes about TV on her blog Hammervision, ropes people into conversations about Game of Thrones, and makes excuses to avoid the gym. Her favorite YA-centric TV shows include 90210 (original spice), Felicity, and Freaks and Geeks. Her iPod reads like a 1997 Lilith Fair set list. She lives in Chicago with her husband, two kids, and a dog. They named the dog Indiana. 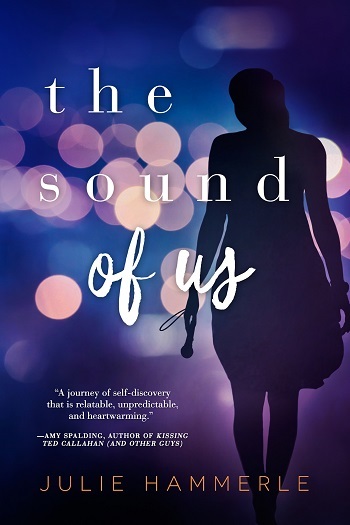 Reviewers on the Wicked Reads Review Team were provided a free copy of The Sound of Us by Julie Hammerle to read and review.